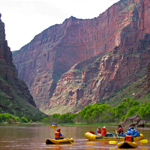 The Rafting Season has started! We have already run our first two trips of the year! 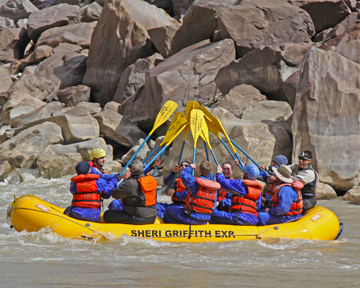 On March 25th Sheri Griffith River Expeditions took down a group of 12 people on a sunny Westwater Canyon 1 day trip. With Izzy and Arlo guiding, the trip went great! No unplanned swimmers and lots of fun whitewater. 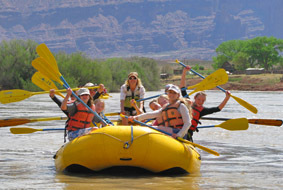 Yes, there were even some very brave ones that hopped into Colorado River for fun! 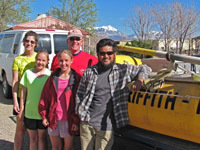 Chris also guided a a 1 day Moab Daily trip with a nice family from South Carolina. The weather was a perfect 70 degrees and sunny! Both of these trips were great trips to start off the season. Now the rush starts!